The White Stripes and Lomography present two completely custom cameras: the JaCK Holga and MEG Diana+. The legendary Diana and Holga cameras are known for their serendipitous 'imperfections' and cinematic qualities. These special editions follow the band's red, white and black color scheme down to the peppermint swirl on their frame advance dials. Frequent collaborator Rob Jones designed the custom packaging for both sets. Only 3000 of each camera were made. The MEG Diana+ Multi Function All-Plastic Camera comes with 'Nobody Knows How To Talk To Children' Ringflash and custom Peppermint Film Mask Filter. Set also includes: camera strap, lens cap, Diana Vignettes photo book and multilingual instruction manual. This camera uses all varieties of medium format 120 film - to be purchased and developed at professional photo labs and specialty stores. 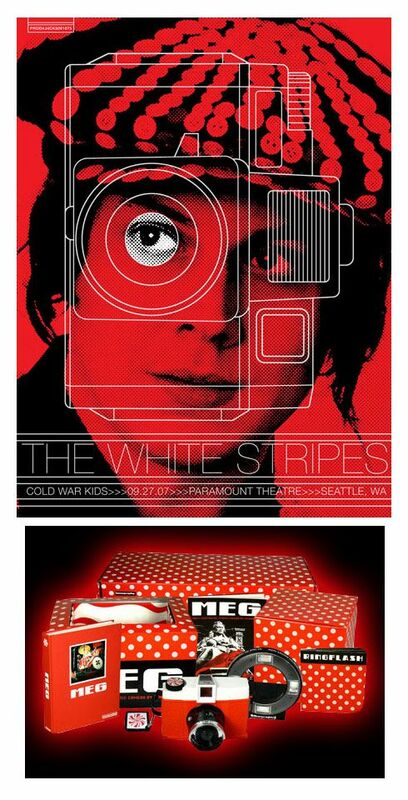 For more info click here for more info on the White Stripes Cameras. Strictly 1 per person of each camera / poster set, or double set. The camera and poster will ship separately packaged. If you want both items choose the special double set and save on shipping.